Whether you’re cleaning up after Sandy, handing out treats or partying down at a monster-mash bash of your own, here we offer — with a few liberties on the theme — something for everyone in this wide-ranging hour of Halloween music. Savor it with someone who frightens you. What better way to start our set than a tribute to the costumed outcasts of society, those who are relentlessly bullied and told things like “you look so absurd, you look so obscene”? Time for them, and us, to let those freak flags fly! The Halloween fest continues with the delightfully delirious mind of Danny Elfman. His “Dead Man’s Party” with Oingo Boingo is just as vivid and cinematic as any of his later film scores. Many a man of a certain age recalls crushing on Winona Ryder in her Beetlejuice turn as Lydia, particularly during her shake, shake, shake down the line in one of director Tim Burton’s many inspired moments in the film. Our triptych of cinematic Halloween songs concludes with a jump to the left and then a step to the right. 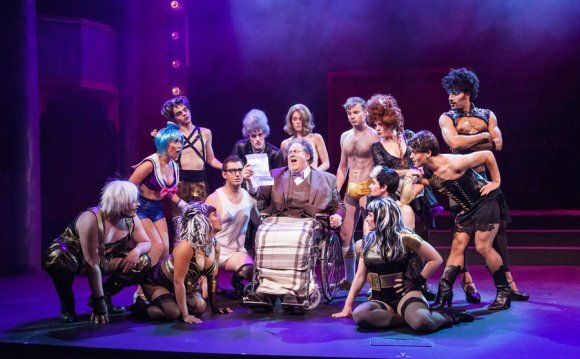 Richard O’Brien’s timeless “Time Warp” is the most fun one can have in Frankenfurter’s abode.